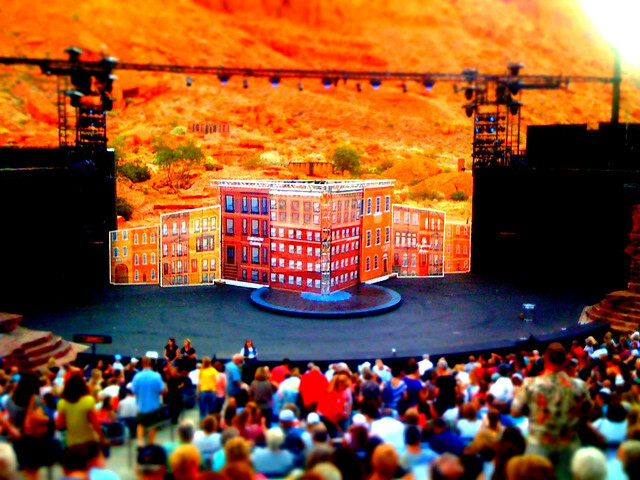 The Tuacahn Theatre lies among the majestic 1500-foot red sandstone cliffs of Padre Canyon in Ivins, Utah. Since opening, the venue has entertained hundreds of thousands of spectators with a selection of popular Broadway musicals. From the middle of spring into the middle of autumn, the Tuacahn thrills audiences with spectacular special effects, pyrotechnics and professional performers. More than a century ago, Orval Hafen and his wife were captivated upon seeing the location and determined to create a homestead. In the early 1990s, playwright Doug Stewart happened upon the destination while searching for the perfect spot to construct an outdoor theater. Stewart’s dream included a 42,000-square foot complex having a 1920-seat outdoor amphitheater, a 330-seat theater, a black-box theater, a costume shop, a dance studio, recital hall, scene workshop and classrooms along with a gift shop. To name the site, Stewart chose the Mayan word Tuacahn, which means “canyon of the gods.” The name proved a fitting description for the property that would later serve as the “Broadway in the Desert.”. His vision became a reality and opened to audiences with the original presentation of the musical “Utah!.” By 1999, production expanded and was named the “Summer Festival of Theatre.” The first season offered the well-known “Joseph and the Amazing Technicolor Dreamcoat” in addition to “Seven Brides for Seven Brothers.” Each of the performances sold out. During the same year, the Tuacahn High School for the Performing Arts welcomed students. The accredited and chartered facility offers classes in acting, dancing, singing and instrumental performance. Surrounded by the natural beauty of the landscape, audiences continue seeing the latest productions presented by professional actors amidst amazing audio/visual displays. The production is based on the wildly popular animated film. The award-winning production brings all of the beloved film characters to life on stage to the delight of young and old. Created by the collaborative efforts of Academy Award winner Alan Menken and Tony Award winner Harvey Fierstein, Newsies takes audiences back to the turn of the 20th century when life on the streets was challenging for a group of newspaper delivery boys. The hilarity and drama unfold as a single mother prepares her Italian hotel for her daughter’s upcoming nuptials. However, unbeknownst to her, her daughter sets a plan in motion to determine the identity of her biological father. Guests are invited to attend one, two or all three shows by taking advantage of season packages. Simply call the Tuacahn box office at 1-800-746-9882 or click here to purchase tickets online.